HK AUDIO will be launching three brand new products on stand number G 110 at PLASA 2004, being held at Earls Court from 12-15 September. An anticipated addition to the German manufacturer's COHEDRA (Coherent Dynamic Response Array) system is the CDR 210 F direct-radiating 2 x 10" flyable subwoofer. Based on the acoustic characteristics of the Cohedra CDR 210 Sub subwoofer, the CDR 210 F has the same basic shape as the CDR 208 S/T mid/high units and can be flown with the same rigging hardware. The enclosure, sloped by 2.25° on top and bottom, allows for the curving of flying bass arrays, enabling up to 20 CDR 210 F units to be mounted directly on the flying frame above the mid/high units. 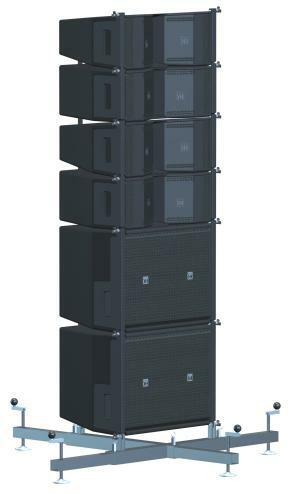 Alternatively they can be flown as a separate bass array or to serve as the basis for ground-stacked Cohedra mid/high units using the Cohedra stacking frame. For transportation, two CDR 210 F units fit into one mid/high unit flight case. The Cohedra Ground Stacking Frame has been developed especially for the CDR 208 S/T mid/high units and CDR 210 F subs. If it is not possible to fly the mid/high units or subs, the frame provides support for stacking a mid/high array or for mounting a full-range stack consisting of CDR 210 F subwoofers and CDR 210 S/T mid/high units. The stacking frame consists of four extensible feet which can also be adjusted to different heights, allowing the stack to be tilted. The stack can be smoothly adjusted forwards or backwards, tailoring the system to the area to be covered. The stacking frame can be easily set up and packed away into a case, facilitated by the removable feet. Plasa 2004 will als be the UK debut for the D.E.A.Con system.